Hi everyone, Andrea from The Cottage Market here! How are you. Guess what…the holidays are upon us and I thought it might be fun to get a head start on the decorating festivities! 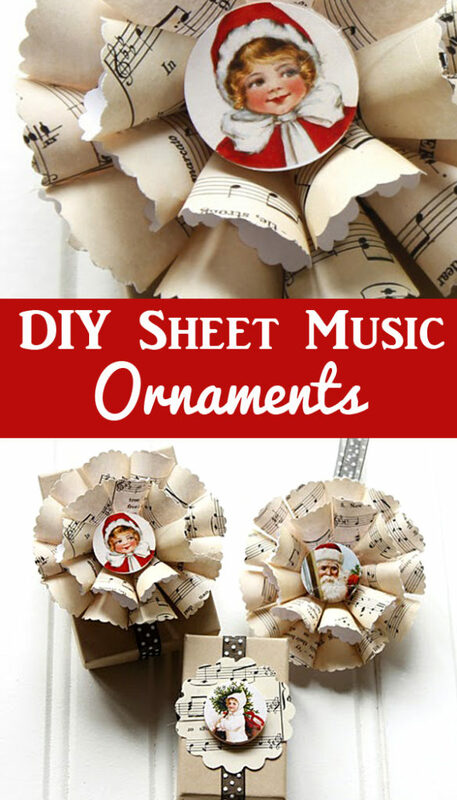 So I have a cute sheet music Christmas ornament diy for you today. 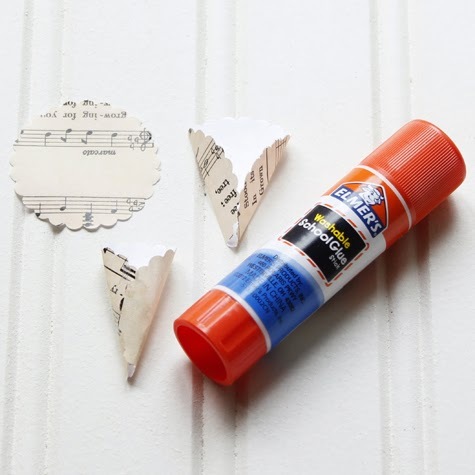 You can also use these little cuties for decorations on packages and if your really looking for a big project…you can make this into a full size wreath and it will look amazing! By the way you are going to want to make tons to share and just imagine a full tree of them…maybe with the family pictures in the center and of course the family pets! So many possibilities. Now what do you need to make these? I used a 1 1/2″ scalloped punch for my ornament but you can use smaller and if you are looking for a larger embellishment…go for it! 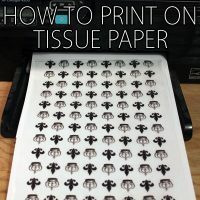 First you need to punch out a stack of circles…easy easy easy!!! Then it is time to make the cones…make lots of them! 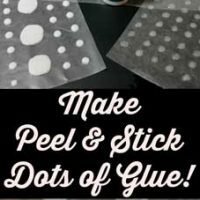 It is something that you can do while you are watching TV or chatting at the kitchen table…just take your circle and gently fold as shown and then add a bit of glue to the left side and then fold the right side over and press…repeat…repeat…repeat!!! Now take your 1 1/2 inch wood circle or whatever size you are using and start the building process. I use hot glue for this part. A little dab…press the cone on…repeat and repeat and repeat till the circle is full. They you will probably want to add another row…so just move the cone tips to the center and make another go around. 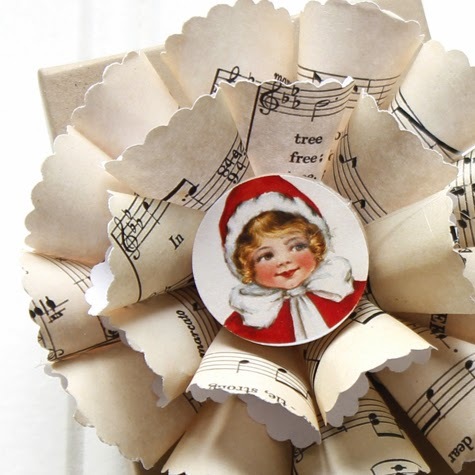 You then apply a vintage Christmas circle graphic to a wooden medallion (I used the Christmas Elf Girl Image) and hot glue to the center…then all you have to do is attach a ribbon loop and you are ready to hang! 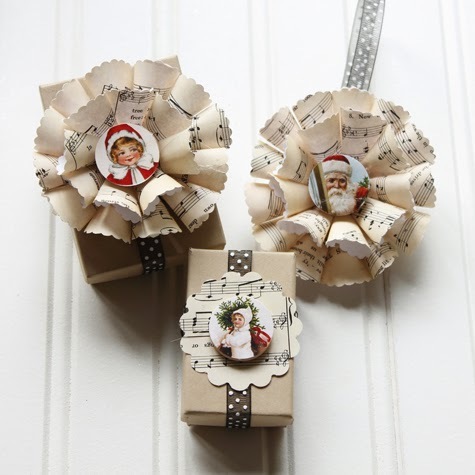 You don’t have to use them as ornaments…you can also use them to decorate your packages instead of a bow…I know everyone will love these as part of their present! 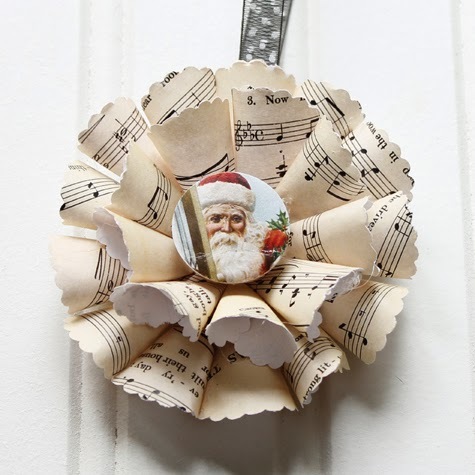 If you need just a quick wrapping embellishment…just punch a larger scalloped circle and then glue a wooden medallion with an image on it onto and viola…in seconds you have a gorgeous package! So many possibilities…so many choice Explore the Christmas images and find the perfect centers for your creations or like I said above…family photos…beloved pets…an endless selection to make these with your personal spin!. Hope you have tons of fun making these! They would look fabulous with other images here at the graphics fairy…have a look around at some of her scrapbooking sheets…I just love the vintage music sheets though…they are such a festive touch!. OH MY GOSH, these are so cute. I made a big wreath once with pages from an old hymnal; plus I made an advent calendar last year from the center images. 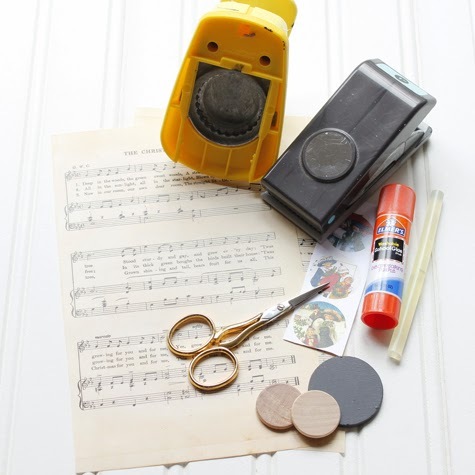 HOW COOL to combine the crafts….can’t wait to do some of these! TFS! What an adorable ornament! The scalloped edge adds a sweet touch, but smooth circle punches would be lovely, too. I also love its use as a package topper! I can’t get to craft stores very often, so I might be tempted to use cardstock or cereal box punch-outs in lieu of the wooden circles. 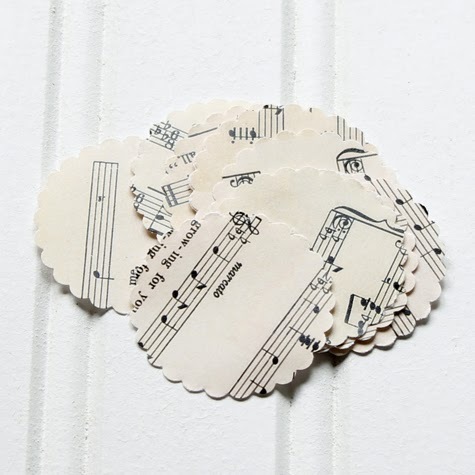 If I used a cereal box, I would cover the exposed side of the larger back circle with a sheet music punch-out. 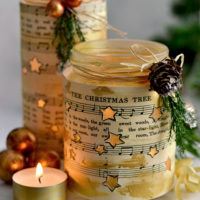 Hi, do you just use one circle per ornament or do you glue 3 together lilke in the picture? So cute, can’t wait to make them!!!! Oh Karen! I am so so sorry! I see where that was confusing…only 1…I was just showing the progressions of adding the little cones on and used a few to show the additions : ) It is all done with one circle : ) The cool thing is…you can use different size circles and make bigger ones and if you don’t have a wooden circle…you can cut a circle from illustration board…foam core or you can even use a cake round : ) it all works : ) Thanks for bringing that up…: ) Enjoy and hope you get to make tons of them! Love these they would be great on the cover of a mini album as well. I will have to make one (or more). They definitely look vintage and right up my alley. Thanks so much! Instead of Black Friday shopping, 7 of us get together to make Christmas ornaments. Each one of us brings instructions and supplies. This is what I’m bringing. They are fantastic!! Thanks so much for sharing. I am so going to make some of these. These would make nice inexpensive gifts for people at work. I also think they would look really cute strung on a banner by themselves or interspersed with pennants. Or hang them on evergreen boughs on your mantel. So much you can do. I can see this also changing up for Valentine’s Day or Easter or 4th of July!! Love it. I LOVE ALLLLLLLL Of your ideas Ronda! They are actually endless! Thanks for sharing them with everyone…they are great! They so can be changed up for any holiday…that is for sure…I am actually going to try making teenie weenie ones for egg decorations come Easter! hugs and enjoy! These are darling, Andrea. I could see a little table top tree adorned with these. Maybe even a large Christmas Tree! What we do without Karen and the Graphics Fairy? 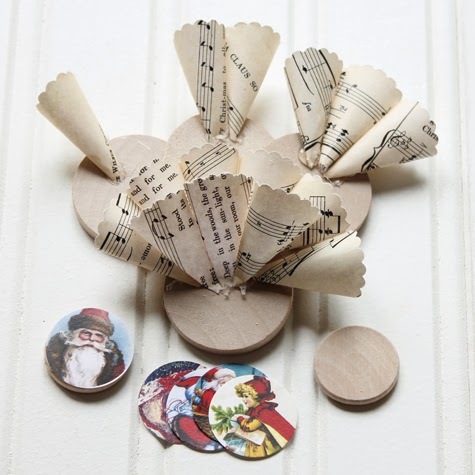 Lovely, and I have all I need to make these – except the wooden discs… Where can I find those?